a. Autoimmune links: The cells fighting among themselves leading to the destruction of the melanin, is one of the reasons. There are other immunological factors as well. One of the studies has suggested a role of some neuropeptide Y (NPY) which may damage melanin. Such neuropeptide may be released in response to skin injury or emotional stress; again suggesting a combination of causative factors. b. Hormonal connections: Affection of certain hormones such as Thyroid hormones or Melanocyte Stimulating hormone may be responsible for vitiligo. Also, the simultaneous occurrence of vitiligo and other hormonal disorder suggest underlying genetic factor. As per this theory, there is self-destruction of melanocytes and hence the melanin. This could be a result of genetic, immunological, neural or stress factors. There are factors, internal and external, which either predispose or trigger or maintain the process which leads to the development of vitiligo. In most cases, more there may be a mix of causes. The familial incidence of 20 to 30% is observed in the family members. If one or more of the parents have vitiligo, there are more chances of one developing the same. However, it is not a rule. At the same time, numerous cases of vitiligo do not have a relevant family history of Vitiligo. A study at our center also shows that the patients who have either extensive vitiligo or those developing vitiligo spots on both sides of the body (bilaterally symmetrical) have a strong genetic element. 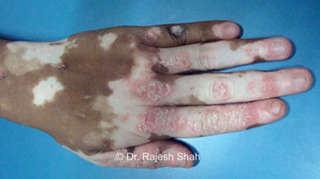 In other words, it is difficult for any patient to have extensive vitiligo without genetic links. Research suggests that Vitiligo and Hypothyroidism (Underactive thyroid) often are predisposed to the same gene (NALP1 gene). 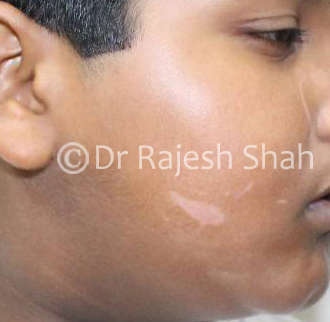 All patients of Vitiligo are suggested to get Thyroid profile done every six months. Thyroid profile entails blood sample study for T3, T4, and TSH (Thyroid stimulating hormone) hormones at a small cost. Vitiligo after injury: In some of the cases of vitiligo, patients are at risk of losing pigment or develop vitiligo after any bruise or injury. One such example can be seen in a case-photo on this page. Other factors: The precipitating factors have been identified as due to the pressure of tight clothes (such as on the waist) or certain occupational hazards such as wearing certain rubber hand gloves. Long-term intake of certain drugs is found to produce this pigment disorder. In many cases, especially in children, we often have no clue why one develops vitiligo. All said and done, there is definitely an abnormal process of melanocyte destruction and defective melanocyte formation, governed by known or unknown factors. It may be noted that some of the above remarks are based on our study of over 6500 cases and they may not be found in the standard dermatological textbooks. We are still learning and exploring vitiligo, like many other diseases. Like many disease conditions, the exact causation yet remains a mystery! Lichen Planus, Psoriasis, and vitiligo: Some cases of Lichen Planus and Psoriasis may be observed to be associated with vitiligo, on the same location. 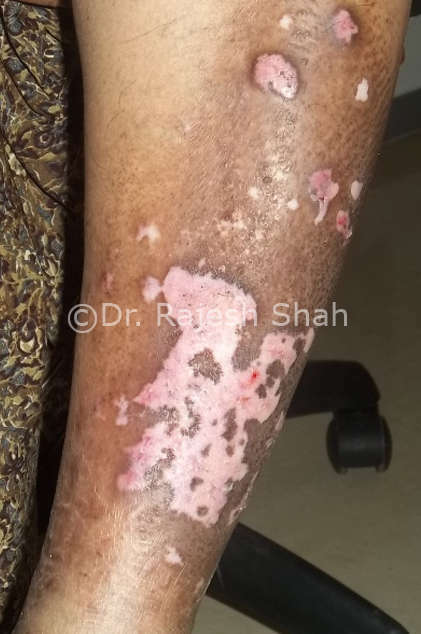 In some cases Psoriasis or Lichen Planus may be a cause of loss of pigment, leading to vitiligo, which is relatively more difficult to treat, as per our experience at Life Force. Here you can see a couple of illustrative cases of concomitant existence of these disease conditions.